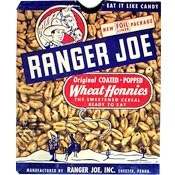 Ranger Joe was a kids' radio show that aired in the 1940s in Philadelphia. This cereal was actually manufactured by the same company that produced the program. (This is no stranger than the fact that since 1931, Procter and Gamble has been actively producing soap operas through the present, first on radio and later on television.) The idea of pre-sweetenening the cereal was to make kids use LESS sugar. It would be fairly easy to dump a cup of sugar into a bowl of unsweetened cereal. 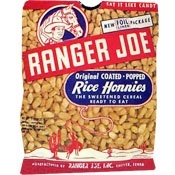 When Ranger Joe went off the air the cereal brands were sold off back and forth several times until they became the property of Nabisco who changed the spelling of Honnies to Honeys. This was the very first pre-sugared cereal.